Ever loaded up a video on Twitter and then wanted to carry on reading tweets while you watch? Good news: a new feature from Twitter lets you do just that, albeit with a couple of limitations. First, this is an iOS only bonus that isn’t currently available on Twitter.com or anywhere else. Second, it only works with videos that use Twitter’s internal video player. Meaning, YouTube and even Vine videos won’t work. Which makes this a bit of a lacking implementation right now, but, you know, baby steps and all that. Here’s how it goes: start playing one of the Twitter videos (again, only on iOS) and, when the clip launches, tap the icon in the top right corner to minimise the player, which will then keep playing while you browse around the rest of Twitter. 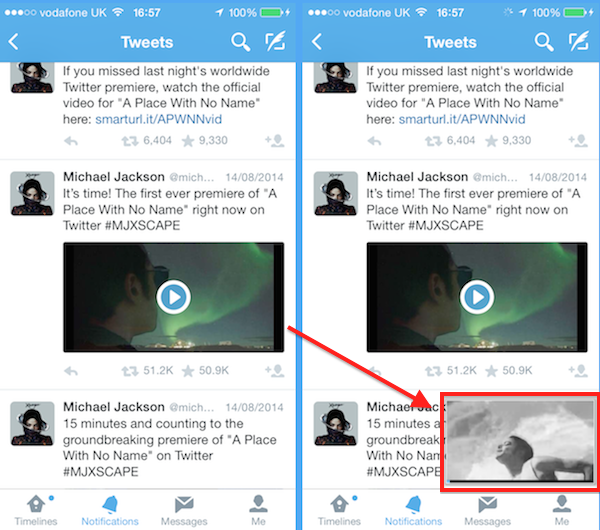 Here’s an example, using Michael Jackson’s latest video, which launched exclusively on Twitter, which comes from this tweet – load it up yourself in your iOS device to see how it works.